In 1968, the Beatles took a three-month trip to India where they spent time in Rishikesh, India on the banks of the Ganges River. They stayed at the ashram of Maharishi Mahesh, the renowned founder of Transcendental Meditation or TM. At the ashram, the Beatles were able to seek refuge from the dark side of their uber popularity. This was at a point in their career when they could hardly do anything in public without traveling in an armored vehicle with a team of bodyguards. Amidst the need for a sanctuary from their public life, an underlying thirst for something greater than material success gave their trip to India a spiritual tone. This was at time in which the whole world had their eyes on the Beatles. Almost everyone under 35 years of age wanted to be like and do whatever the Beatles were doing. 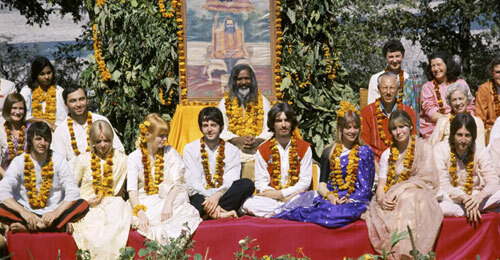 Suddenly, the Beatles were going to India to hang out at an ashram and learn yoga and meditation from an Indian guru? – totally far out and groovy. This act in and of itself was one of the greatest influences in the growth of yoga in the Western world. This three-month period was the Beatles most productive songwriting period ever, in which they wrote a total of 58 songs. Infused with elements of Self – realization, psychadellia, cosmic unity and gratitude of the Guru’s grace, their hit, All Across the Universe is one of the songs which personifies the mood of their pilgrimage to India. Along with George Harrison’s My Sweet Lord, these two songs are perhaps the Western world’s introduction to the sanskrit chanting of bhakti devotional yoga. To the average listener, this song may not at all seem deeply spiritual or rich in yogic overtones. The chorus of the song “Nothing’s gonna change my world” may easily be misunderstood as a negative hippy attitude of someone who is socially, spiritually and environmentally disengaged from the world with no hope of making the world a better place. What is actually being expressed in the chorus of the song is the experience of realizing the eternal, non – changing nature of the Self. Atma Darshan is a Sanskrit term for a moment when an individual “sees” or experiences this eternal true Self. Once this occurs, the individual becomes established in the Self and no one or nothing can challenge or take away this newly established awareness of core personality. Nothing can change this. The chorus begins with “Jai Guru Dev, OM” Directly translated: Victory Teacher God, this phrase is commonly used when expressing gratitude for the grace of one’s teacher who shows the way to the divine; by grace and synchronicity; often in a miraculous way. OM denotes the sound of all of creation and in this context, refers to witnessing the vibration of all sound, light, love, thought and energy which pulsates throughout the Universe. The Lyrics of the song suggest that certain actions are occurring which are personal as well universal, suggesting the awareness of a brilliant and psychedelic cosmic unity. In conclusion, the song is hinting to the fact that our thoughts, actions and emotions (karmas) extend far beyond our immediate sense field. So, be mindful every step you take. We reap what we sow. Most importantly, All Across the Universe suggests that to have a strong sense of self will, do your practice so that your peace of mind will not be disturbed by what arises or disappears. O mind! Engage your flow in Nivikalpa Samadhi, then thought-constructed virtues and faults will not be capable of touching me. I will not be affected by the pitcher shaped breasts of beautiful women with eyes like that of the black antelope, nor by whether I am considered to be respectable and proper, or a lost idiot. Jai Guru Dev – OM.